Hi all. I hope you all are fine. 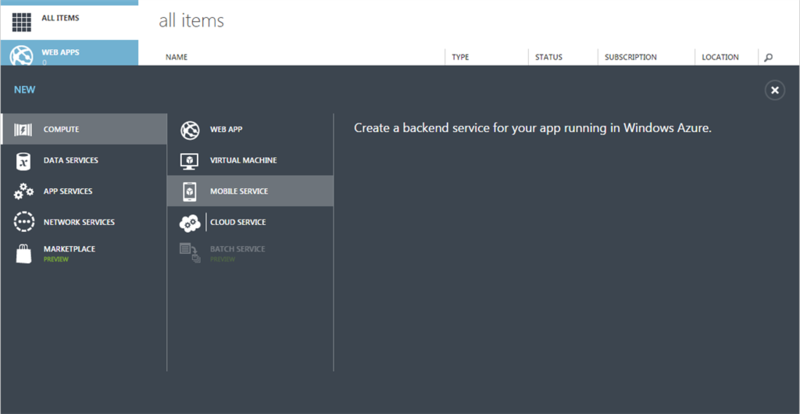 Today we will learn how to configure a mobile service in Microsoft Azure. I know you might have tried Azure, however I am new to Azure. And I thought there would be some people like me. 😉 If you have a good knowledge of Azure then please share your knowledge, so that I can also be like you. We will configure the mobile service in a step-by-step manner. I will share the screenshots here. Login to your https://manage.windowsazure.com/ account then use the following procedure. Click on the + icon at the left bottom side, so that you will get a screen as follows. Click on the mobile service as shown in the previous image. After filling in the required fields, click the Next arrow so that you will go to the next page. Click the tick arrow to finish the initial set up. Once doing that, your service will be listed in the next screen as follows. As a final step, it is now time to ensure our service is ready. Just click on the link under the tab URL. You will get a screen as follows if your service is ready. Wow, is that all? We have done it. So simple, right? Now please share your valuable suggestions and feedback. It really means a lot. Please help me improve my knowledge. Thanks in advance.